Peter Wallace interview, Friday 11th April 2014. This is the first of a two part interview with former mechanic Peter Wallace as he looks back at F1 racing in the 1970s and what types of cars he used to look after. He has also answered some of your questions too. If you could pick one piece technology from today’s cars to have on the cars that you worked on what would it be and why? Built in roll cages that they have now, it would make the cars lighter and stronger. It would prevent some of the injuries sustained by drivers back in the 70s. The stat for driver deaths was quoted as roughly two drivers a season. Is that an accurate description of what used to happen back then? Hmmm, not really that accurate; there was more injuries than deaths. There are of course retirements through injury of course so maybe out of the twenty five drivers you might well have had two not finishing the season but there were very few deaths I remember. The worse experience I remember is when a car went over the embankment. The old circuits all had grass embankments at some point in on the track, which they don’t use anymore, and one car went up and over the embankment and hit an electric cable at speed. This cut his head clean off and it rolled back down the grass. Wow, were there lots of people watching that race? I can’t actually remember, I just remember the image of it. I didn’t see it at the time but the papers were there and it was all over them so the race must have had some good coverage for the photographer to be there. What type of race was that? It was single seater racing; I think it may have been Formula Junior. So potentially an up and coming driver lost his life then? That’s awful. Moving on to a safety question from Chris Howells, modern cars are a lot safer but back then what did it feel to lose a driver when you were in the pit? Well luckily it never happened to me, to my drivers. So I can’t answer that question from experience but I knew drivers who did lose their life or sustain serious injuries. How did you feel for the safety of your own drivers then? Particularly if a circuit was known for being a dangerous one, like say the Nurburgring. It’s not something you really think about, the drivers probably thought about it a lot more. But working as a mechanic it was just like a job, we were employed to do a decent job just like the drivers. It’s interesting you refer to it as a job because Nikki Lauda came out and stated it was just a business. He was in F1 to prove to his family you could be successful without choosing a traditional job. However the depiction of James Hunt was that he wanted to do it for the joy of racing and the fame that came with it. In your experience was there a split in drivers like that? Well I knew a few drivers but can’t really comment on a large scale as I only observed from a distance because I wasn’t actually a Formula 1 mechanic. Ah now this is interesting, so you were in the pits at the time but you actually worked on different cars, what were they? This is something I haven’t heard of, what is a Saloon car and Saloon car racing? Well a Saloon car is basically a sports car like a T70. Nothing like the road versions you get now, where you can have two different types, back then they were purely racing cars. Most of this type of racing was done in the states. So it wasn’t as fast of F1 racing then? No not as fast but still needing the same skill of driving. Do they still do that type of racing today? Yes but they don’t reach the speeds they did back then but it’s a lot safer now. How many seats do Saloon cars have then? Just the one seat? No they were two seaters, unlike the one seater F1 cars. Well they were a minimum of two I should say, they can be four. So it’s not like Rally racing then, you can see how much I know about cars, you wouldn’t have a co-driver in there? No just the driver on his own. 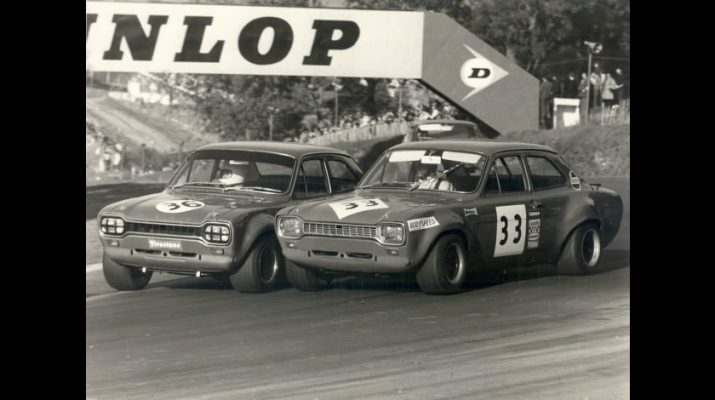 There were twenty four hour races though where there would be two drivers in the car. So they would swap over the driving load, do it in say two hours stints. Would the pit stops in Saloon races be as quick of F1? No not in those types of races. The new rules in F1 now mean that it differs from pit stops in the 70s though. Now each car will carry enough fuel for the race so that there is no need to refuelling in the pits which cuts the time slightly. There are huge costs in motor racing, in all forms then; did you ever see any companies go bust through a lack of funding? Well it wasn’t known why a company would stop racing, like when Hesketh pulled out we had no idea why, maybe they had decided to concentrate of other things. How did the costs differ then looking at the different types of Formula racing, from F1 to F3? Yes there was a big difference of the companies putting cars in. So F2 and F3 were they still international races or just based in the one country? Mainly based in Britain but the occasional race was on the continent. This is where junior and aspiring race drivers start off then, a bit like the lower divisions in football? Yes it is; the races in Europe that helps them get spotted by more companies in F1. Steve Evans asks what teams did you work for? I worked for Alan Mann racing who were an American race team. Then I set out with another mechanic to form our own team. That’s brilliant so drivers would drive under your name then? Yes, our name was Mathwall engineering a combination of our two names. So did you ever compete in any races yourself? Well there was a race come rally called the Tour of Britain; it was a rally between the circuits then a race on them. This consisted of a 20 lap race round each one along with the on road rally to get to each place. I was actually the driver between the circuits for our team. Oh nice, and that bit was still part of a timed race then? Yes, obviously it wasn’t racing on the roads but you had to be at the next circuit in a set time. You couldn’t hang about and stop for a cup of tea or anything, which was hard with other traffic on the road. So did you ever get to go on the circuits in the cars you worked on? Yes every morning you had to warm the cars up, so the pit men used to take the cars round the track a few times which was great. Which tracks have you been on then? Well you’ve got Silverstone, Brans Hatch all the big ones in Britain and some in Europe. Oh yes different places in Europe and I even managed to get out to the States. That sounds great, how was the racing in the States? There were a few different types of Formulas out there but there were still huge crowds watching the racing.